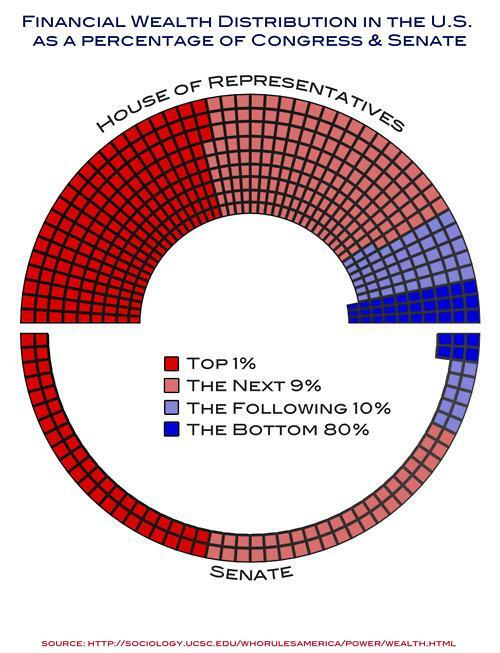 If it seems like our Congress is catering to the whims of the 1%, it’s because they have more in common with them than they do with us. Take a quick read at The Daily What – the collective net worth of our federal lawmakers jumped 25% in TWO YEARS. What recession? It’s yet another example of how broken and corrupted our system of government is, that you need to be in the wealthiest income percentiles to get elected to office. And it makes an even stronger case for reforms such as the Saving American Democracy constitutional amendment. Many Occupy L.A. protesters arrested during demonstrations in recent months are being offered a unique chance to avoid court trials: pay $355 to a private company for a lesson in free speech. The irony is so thick you could cut it with a chainsaw. At a time when our governments are working overtime to figure out new ways to curtail First Amendments rights as much as possible, and at a time when corporations are running more and more of our lives, the city decides to outsource their justice with a free speech class? Free speech, protest, and civil disobedience are integral parts of American history. Without them, there would have been no civil rights movement, no end to segregation, no right for women to vote, and in fact, no independence from Britain! Occupiers deserve a huge thank you from all parts of society, for standing up (finally) to the gross imbalance and corruption in our political system. People like Carmen Trutanich should be ashamed of themselves for this patronizing, insulting behavior. If they spent half as much of their resources fighting against the true criminal actions going on in our midst, we wouldn’t need Occupiers in the first place. I am writing to you in regards to your comments quoted today in the LA Times article Councilman wants to see the bill for allowing, ending Occupy LA, and I wanted to personally thank you for helping keep people’s attention on what is truly important about this movement. I was so disappointed in the mayor’s decision to clear out the camp this week, and appalled today to see the debate centering on petty issues like cleanup of the park space. I am so sick and tired of seeing politicians and the media try to distract our attention from important issues by focusing on irrelevant sideshows, and today’s brouhaha over the state of the City Hall park is just one more example of this. As you rightly pointed out, we should instead be discussing why so many people feel that their only option is to go out and occupy spaces all over this country. Instead of belittling them and telling them to get a job, we should be trying to create opportunities in this country so they can find a job. And instead of complaining about the homeless around the camp, we should be focusing on the root cause of why there are so many homeless on our streets in the first place. It is so easy to overlook it when one of our politicians says something we agree with it, and so easy to jump on them when they do something that rubs us the wrong way. I wanted to take a moment to let you know that your words are very much appreciated, especially at a time when they are also so needed. I’m hearing disturbing reports that the city is planning to clear the Occupy LA camp sometime next week. I have to urge you in the strongest possible terms to let them stay. I understand that Occupy LA is an inconvenience to the city, and there are concerns over the well-being of the park space around City Hall. However, this pales in comparison to the actual suffering of millions of Americans right now. The men and women in Occupy LA are sacrificing so much to try to change a system that so many of us have lost faith in. To try to stifle their voices would be to turn your back on the qualities that have made this country so great in the first place. PLEASE, let Occupy LA remain. I assume you originally entered politics to try to make some kind of a difference, and to leave a legacy with this city. Here’s your opportunity. Moments like this come once in a generation, if we’re lucky. Make the right choice, for the sake of Los Angeles, and for sake of the United States of America. I thought I’d write about our own experiences taking part in the Occupy LA protests. I’m in my early 40’s, at a well-paying job as a web developer for a large hospital in Los Angeles. My wife and I have no children. We’re very fortunate – we actually have a steady income and good health insurance. Yet, we live in a house that we share with another college-educated friend of ours because we couldn’t afford our own place. The house is deep underwater, and we’re drowning in debt (and shame on us for not reading the fine print when some of the credit card issuers arbitrarily raised our interest rates to 30% on cards that had never had a late payment EVER). We’re barely making it check-to-check, but somehow we are still making all of our payments. It would be so much easier to walk away from it all, but we have a sense of responsibility to these debts that we voluntarily took on. What we’re demanding — what people in the Occupy movement are demanding — is the same responsibility from these large institutions, and the so-called 1%. It’s really that simple. When the financial industry came to the brink of collapse because of the reckless behavior of these “too big to fail” corporations, we saw an amazing ability for our government to come together to bail them out. In return, they’ve repaid the favor by working night and day to lift the already watered-down provisions of the Dodd-Frank reforms so they can continue with their same insanity, and to basically act like spoiled, entitled brats towards those of us who saved their butts in the first place. Contrast this with any legislation in Congress that might actually help out rank and file Americans, and suddenly everything becomes gridlocked and impossible to achieve. From out here, it appears that when you have a lobby on your side, government works, and if you don’t, well tough luck. We march for three simple things: tighter regulation of the financial industry (a return to Glass-Steagall would be a big step), a demand for shared sacrifice amongst *100%* of this country, and to wake up those in Congress who have been listening only to the lobbyists and the media chattering classes, and losing sight of the fact that this country is a DEMOCRACY, of the people, by the people, and for the people. These are not radical notions, and they’re not even strictly left-wing (personal responsibility seems like a classic conservative belief to me). This is the no-longer silent majority in this country, across the spectrum, who have finally had enough.